There’s nothing that will have you calling a technician quicker than discovering melted ice cream in the freezer or warm milk in the refrigerator. Often, the issue is easy and simple to repair. Other times, it includes major parts and an outrageous repair bill. That’s when you’re confronted with a problem: Should you fix it or replace it? Sylvester Greene, the owner of many appliance repair stores around the USA, provides the following details to help make that choice much easier. There may be a basic option before calling for repair that you can try out on your own. Ensure the refrigerator is plugged in all the way. This sounds silly, but sometimes it comes unplugged without you realizing it. Examine the breaker to make sure it hasn’t been tripped. Take a look at the coils. If they’re obstructed with hair and dust, vacuum them. If the issue is with the ice maker or water dispenser, try changing the water filter. See if the products in the refrigerator are obstructing duct. Ensure the ice maker wasn’t mistakenly flipped to the off position. The food area of the fridge isn’t cooling correctly. A thermometer is the best way to watch this. Preferably, temperature levels must be 0 degrees in the freezer and between 37 and 40 degrees in the refrigerator. There are weird or loud sounds coming from the fan. The device is not dispensing water correctly or not making ice. Doors are not sealing appropriately. There’s nothing in a refrigerator that can’t be replaced or repaired. However, there are some problems that your refrigerator may present that may make you want to replace rather than repair. Here’s some situations that would fall under this category. When the freezer side is not cooling appropriately (0 degrees). If the refrigerator is 15 years or older. Thinking about energy cost savings alone. It deserves updating to an energy-efficient design. To compute cost savings, take a look at Energy Star. If the repair work costs half or more of the cost of a brand-new refrigerator. 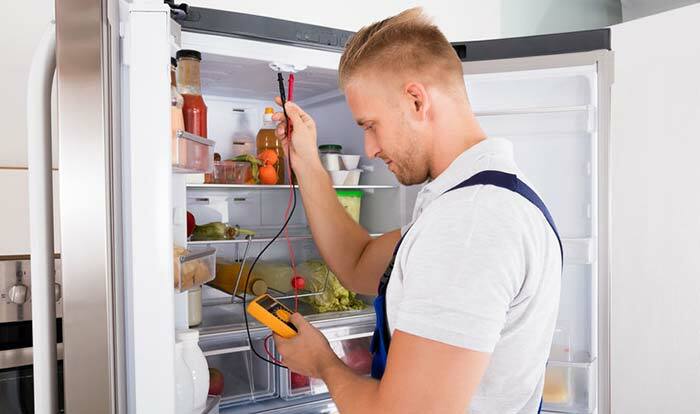 Before it comes to you needing to completely replace your unit, there are some basic things you can do to extend the life of your refrigerator. Don’t overload it. The more food and drinks you keep, the more the compressor works to keep things cold and fresh. For effective operation, air has to flow around food, so space products a little apart on racks. Likewise, ensure that food does not obstruct interior air vents. Limit the variety of times you open the door. Whenever the doors are opened, the temperature level inside boosts a number of degrees, making the compressor work harder to keep food cold. Keep door gaskets clean so they seal effectively. Accumulation of sticky foods on the gasket means you’ll need to pull harder to open and this can ultimately tear the gasket. Clean gaskets frequently with a little warm water and you’ll save money on repair costs and electrical power. Vacuum fridge coils along the bottom or back of your device. This will keep your refrigerator running effectively and conserve you cash. Remember to dispose of rotten and gross foods. This will avoid contamination and keep your refrigerator fresh and tidy.